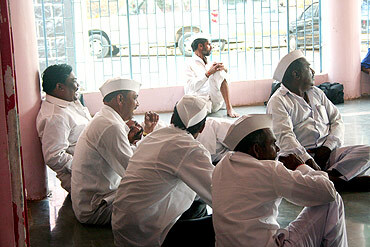 Anna Hazare's elf-like spirit clearly betrays his age and fatigue. Despite his 97-hour long fast that culminated with the central government accepting his demands on the Jan Lokpal Bill in toto, Anna doesn't look fazed when a bunch of journalists surround him inside his austere, one-room accommodation in a village temple in his hometown Ralegan Siddhi. Are you hopeful of the Jan Lokpal Bill becoming a law by August 15? The deadline seems a bit stiff? What will be your action plan if the law is not passed by August 15, 2011? I am certainly hopeful (of the bill becoming a law by August 15) based on all the events (his fast unto death and the support he gained from people across the country) that have taken place in the recent past. If that does not happen, then we will have to once again launch our agitation. What will be your message to your supporters to help sustain the movement? This is just the beginning for the country's second independence (from corruption). We still have a long way to travel to reduce corruption in this country, and apart from the Lokpal Bill we have to do a number of things. 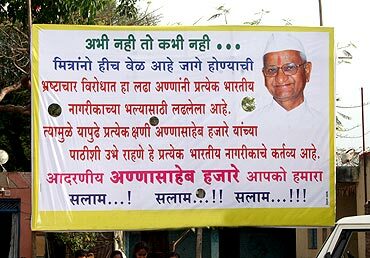 And it is not possible by just one Anna Hazare. The entire population of this country will have to support this agitation. Today, the common man is finding it difficult to live. We will continue our efforts by creating awareness about this bill by touring different states in the country, by finding good people from these places, by organising them. We will be able to do this. But, like I stay in a temple, I don't have a bank balance, I only get a pension of Rs 6,000 and I don't have a bank balance of more than Rs 40,000 and if we have to travel across the country then we will have to think about this aspect (of financing this tour) and we will have to consult all our friends about the economics of this tour. I have dedicated my entire life for the betterment of society and nation and because of this I will be able to tour the nation till I have life in my body and strength to travel to distant places. There is a little misunderstanding here; who are political leaders? People's servants, and despite being people's servants you think of yourself as if you own the people of this country then people will have to remind the political leaders that they are public servants and not owners. Till now have we abused anybody? Neither have we criticised anybody using harsh words. We speak based on the rights that our democracy and republic have given to us. The people of this country became the owners on January 26, 1950 and they have sent their servants to teh Vidhan sabha and the Lok Sabha (directly elected legislative bodies at the state and national levels). The people have made it clear that they are the owners and own the treasury and have elected the leaders to plan for the betterment of society. If politicians (servants) have reversed this role then it becomes important that the people of this country remind these leaders as to who the real and rightful owners are. The leaders should be held accountable for the Jan Lokpal Bill not getting converted into a law for as many as eight times when it as introduced in Parliament. Didn't you know this (the import of such a bill and how it will help tackle corruption)? In such a situation what do you expect from the people? Keep quiet? We have to use harsh words in this situation. I have always stated that Gandhiji held use of harsh words as violence but today the time has come to use harsh words when people (the leaders) take our independence for granted and misuse it leading to the collapse of our society and nation. Our country that was called as sone ki chidiya (the golden sparrow) had reached a stage when it had to pawn its gold (referring to the 1991 pledging of gold with bank of England to help finance imports when Manmohan Singh was India's finance minister). Today we have reached a stage where states have been borrowing to repay earlier debts. Who finally pays for these borrowings? Every newborn comes to the world with a debt of Rs 25,000 on her/his head. What's her/his mistake? Is taking birth a mistake? When this situation has emerged because of the mistakes of these people (our politicians); they went blind to the people's concern in their fight to gain power and money. Money by becoming powerful and power through money, that's all. Let the nation and society go to the pits, we are not bothered. When such a situation arises ordinary people have to raise their voices. They are the owners of this country. Do you think that ministers like Kapil Sibal who came to pacify you during your fast unto death are now singing a different tune and are planning to scuttle your movement? Till the time the people of this country are with me we can launch an agitation like this (the staging of fast unto death to pressurise the government) any day. And if we start such an agitation again the current government will have to face more damage (to their reputation) than what happened in the last few days. 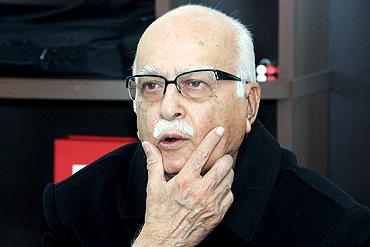 Kapil Sibal had called me and denied that he ever said to the media that the Lokpal Bill would not solve our problems. Your critics say your movement has been egged on by the RSS and are questioning the timing of your agitation. They say, like you have stated just now, that Anna also knew that the Bill could not get converted into a law on eight previous occasions so why is it that only now you have launched your agitation? There are a lot of people who say that I am with the BJP, I'm with the RSS. (What I will tell these people is that) you see the world in the colours that your spectatcle are made up of. In my entire life I have not been close to any party or organisation, nor had any relationship with them. I have always focused on one thing: my society and my nation. I can't see anything except this. Then where is the question of being egged on by one party or the other? Which party is completely clean today? Every party is alike, who is so clean? Money and power, money and power (is what they seek). Arre ek din sabko marna hi toh hai, khali haath se jaana hai na (When we all have to die one day what use are these material possessions?). What explains the timing of this agitation when you also knew that the Lokpal Bill was not passed on eight previous occasions? Why this agitation now? I did not have enough strength then (the support of the people). Now that I realised that the people of this country are with me on this matter I stood up to fight the bane of corruption. Do you fear that going ahead there may be moves by vested interests to scuttle your agitation? I am not targeting Sharad Pawar as an individual but as an embodiment. Why should I fear anybody when I know I have done nothing wrong? I live with my life on my palms. Marne se kya darna hai (What is there to fear about death?) Bhagat Singh, Rajguru and Sukhdev never asked for any security. They didn't say we fear for our life, give us security. I will have to be prepared for that (threat to my life and the possibility of somebody killing me because of my agitation). That's the reason I always say Dil diya hai jaan bhi denge, aye watan tere liye (a song from film Karma starring Dilip Kumar, Anil Kapoor, Jackie Shroff and Naseeruddin Shah which means I love you my nation and am even prepared to lay down my life for your cause). Shiv Sena leader Suresh Jain has been saying that there is corruption in the functioning of the Hind Swaraj Trust started by you. What do you have to say about this? 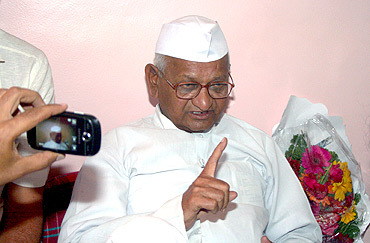 Abhi kahan tak Suresh jain aur Anna Hazare ko leke jayenge (I think this duel between Suresh jain and Anna Hazare should not be given much importance in the current scenario). I have fought against him (Suresh Jain's corruption) for three years. And he finally accepted his guilt. But he has yet again levelled charges of corruption against the Hind Swaraj Trust? Let him do what he wants to do. I don't want to get entangled in this issue now. The press needs hungama (sensation): Suresh Jain versus Anna Hazare. Why bring up such narrow things now? Today we are talking about weeding out corruption from the country. Why think about small issues now? Can you tell us about your letter to dancer Mallika Sarabhai explaining your position on Gujarat Chief Minister Narendra Modi? She wanted to know if I support Narendra Modi. I said I don't support him. 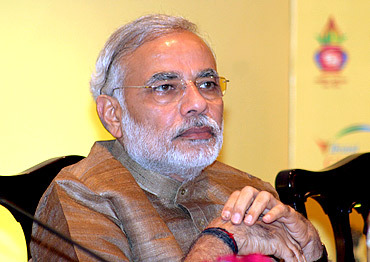 I was asked by the press to comment on the work done by Nitish Kumar (Bihar chief minister) and Narendra Modi. They have done good work in rural development. Nitish Kumar is also doing good work. But at the same time I had also said that if Narendra Modi acts in a communal manner and threatens national integrity then I will not support him (Modi). I said the same thing in Delhi but the press chose to ignore it and didn't publish it because they wanted to create sensation on the issue. I wrote to her that I would never tolerate tendencies that could destroy India's integrity and unity. There was news that the youth in Ralegan Siddhi would immolate themselves if the Centre didn't accept your demands by April 12. Do you support self-immolation as a way of protest to achieve your demands? Nobody should indulge in self-immolation, that is the most extreme way of doing things. When you are immensely saddened, hurt because of the political and social situation existing in a country that is an extreme step but it is not right to immolate oneself. People have shorter memories. What plans do you have to sustain this movement against corruption? We are planning to tour the entire country. We have to visit every single state and unite people under one banner. Forget about Lokpal, we are saddled with so many more issues there is a dire need to reform our election process, it needs to be changed. Decentralisation is also a must; we are having large-scale corruption because decision-making is centralised. There are many more serious issues and we will have to travel long distance before we can rest. The central government doesn't seem too enamoured of the idea of televising the discussion of the draft committee. What plan do you have to change this? Let us see. But my question is, what is the government threatened by (if we televise these discussions)? How long are you going to hide all this? Let the people also know what's happening, who is saying what. After all people are the real owners of this country. Let them know how the taxpayers' money is being spent, where it is spent. After all the MLAs, MPs and ministers are all servants of the public. In that case it is your duty to maintain transparency. We are facing such huge cases of corruption today because there was no transparency in any of the decision-making process in the first place. How did teh CWG scam happen? Because you (the government) tried to keep it under wraps. If you had put all the accounts on the internet nobody would have dared raise an eyebrow against you. Your critics also pan you saying you act as a dictator in a democratic system. If the people interpret independence as a means to abuse our freedom and systems then it is not our fault that we act like dictators. We will continue doing this (act like dictators). If somebody feels that Anna blackmails them and brings pressure on us, let me tell them that we will continue to blackmail till I am alive for the good of society and country.